I was really excited about QuiltCon. I have been watching the Modern Quilt Movement from the sidelines a bit because a guild is a bit too far away. I have stumbled upon so many wonderful and inspiring blogs of Modern Quilters, and I was so excited to go and see these people, quilts, and techniques in person. 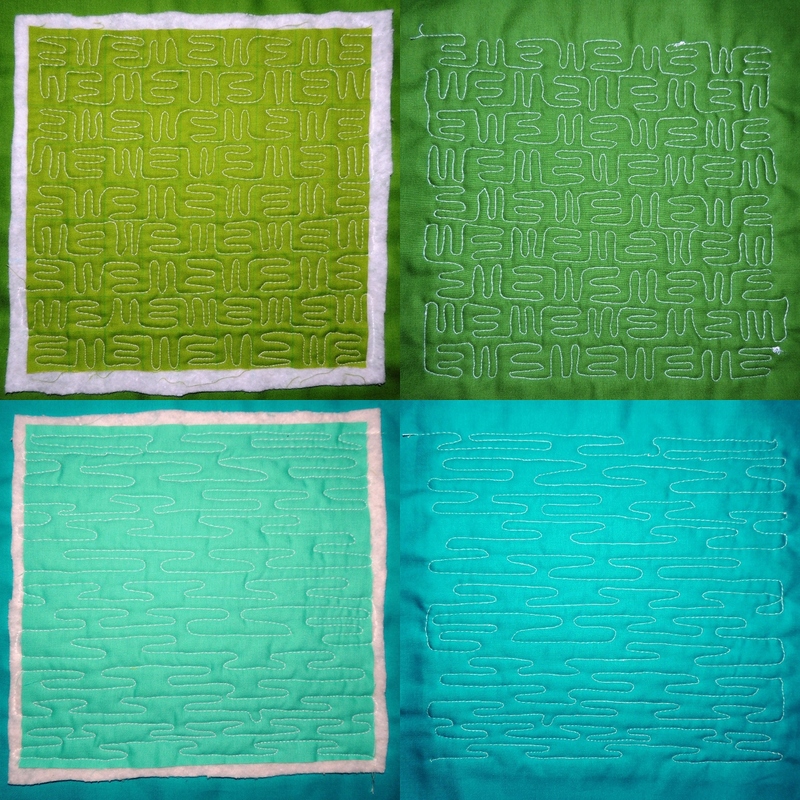 I had fun making and submitting 3 blocks to the QuiltCon Block challenge. The blocks selected for the raffle quilt are amazing and getting to see the finished raffle quilt in person was fun. I arrived Thursday afternoon (the show started on Wednesday), and I met up with my mother who had arrived the day before. She had a chance to take a workshop on Thursday morning, and on Thursday evening we had a few hours to walk around the exhibition hall together. It was pretty quiet that evening, and I used that time to talk with a few sewing machine vendors. 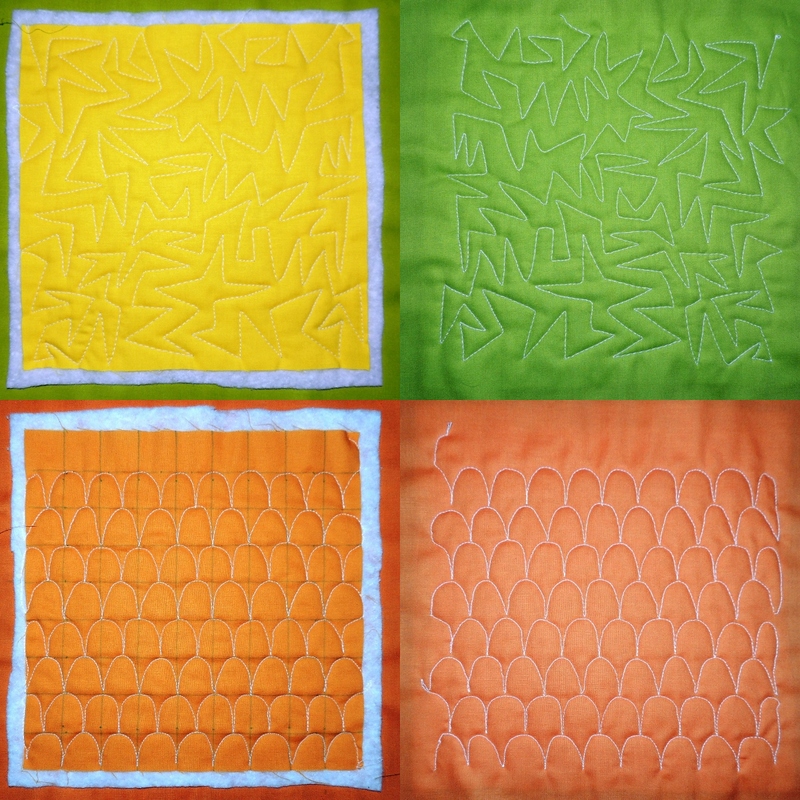 I truly love my Husqvarna sewing machine, but as I am itching to expand my techniques further and explore free motion quilting, I have realized that I am outgrowing it. 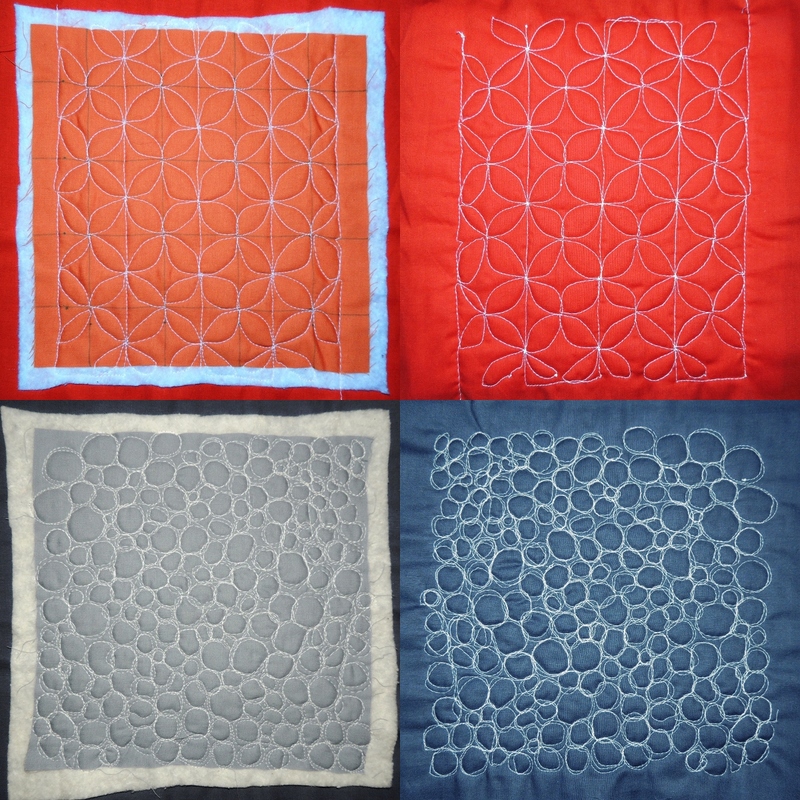 My mother was able to accomplish a miracle on Thursday while I was still waiting to board my plane at LAX – she got me off the wait list for Elizabeth Hartman’s Saturday workshop on “Free Motion Quilting on Your Home Machine”. YAY! Thanks so much, MOMOMOM. You’re the best! Friday was definitely a busier day at the show. We took our time and explored the vendors and all of the quilts on display. I have posted a few photos I took of some of the quilts that I loved. I had to laugh at myself when I looked over my photos when I got home. My biases are so clear – I photographed the yellow/white/gray quilts and blue/white/yellow quilts. Well, at least I’m predictable, I guess. 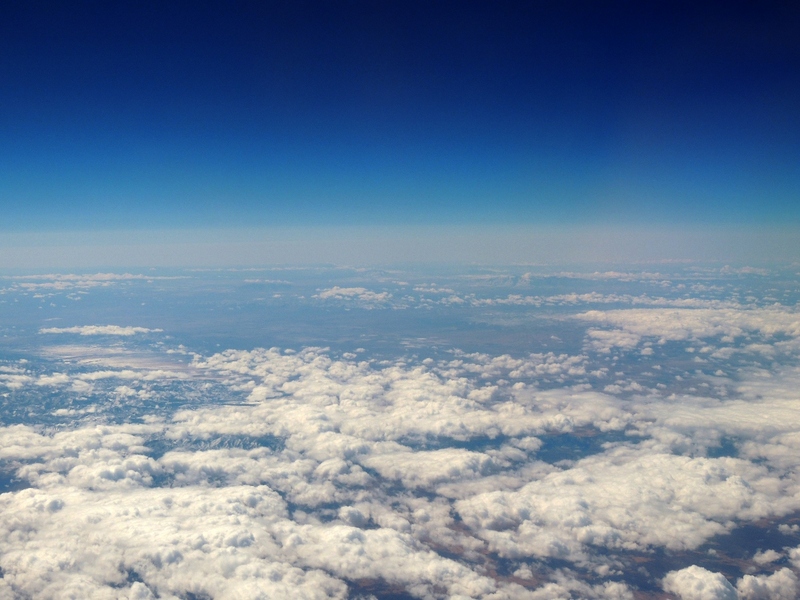 Backing up a bit – I am leaving out one key Austin experience. Food! I do love the little town we live in, but our culinary options are a bit limited. I was so happy to be able to eat at some of my favorite places around Austin: Chuy’s. China Cafe. Whole Foods. OK, yeah, I love Whole Foods and I bought some snacks there… but I also love ooey gooey cheese dip and Tex Mex. I had 2 meals of just chips and cheese dip. Heaven. Of course, I quickly remembered why my weight ballooned when I first moved to Austin… so I made sure to hit the gym in the hotel each night. After jogging up here over 4000 feet, I felt amazing jogging at less than 1000 feet. While we were exploring the quilts on display on Friday, I was super excited to see a couple of quilts that I had seen online. I definitely felt a bit like a fan girl and was trying to do my best not to get all crazy. But then we stopped to listen to a quick demo by Jacquie Geringand Katie Pederson in support of their book “Quilting Modern“. Jacquie was working the crowd prior to talking, and I should have just said “hi” instead of the super awkward gushing I somehow managed to squeak out. Oh well. Because I got into the freemotion quilting class late, we left a bit early on Friday to go to a local quilt show in order to get the materials I needed for the class. We got there at 4:45 and they closed at 5:00. Yikes! But I got all the materials I needed, and I was really excited to get the chance to learn more about free motion quilting! I made sure to get to the class early on Saturday morning. I was really nervous about how it would go. The workshops were stocked with Janome sewing machines, and I was a bit intimidated by using a new machine. Because I got there early, I quickly learned how to wind bobbins and thread the machine from a Janome sales rep, so I felt better having learned how to be a bit more self-sufficient. It turns out I went through LOTS of bobbins, so it was a good I felt confident the rest of the day winding bobbins and re-threading the machine. Elizabeth was warm and lovely. She started class by talking through how she makes her quilt stacks. I learned a lot. I used pins to baste for the first time that day, and I can’t wait to try them on larger quilts. It seems like it will work great and be a lot less fuss than the basting with needle and thread method that I’ve been using! Yay! She showed a lot of quilts that she has done all on her home machine (a Janome). And then she let us explore on our own. The morning was dedicated to practice on muslin. After lunch, we practiced a few other types of patterns and then we were given beautiful fabric to make sample blocks of the patterns we had learned. I was able to get 6 of the 8 blocks done before the end of the day, and I definitely left feeling really excited about free motion quilting!!! The workshop instilled a lot of confidence, and so I took the plunge and ordered a Bernina 820. EEK!